New Book about the Mid-’90s Punk Explosion | Oy Oy Oy Gevalt! In the Introduction of Oy Oy Oy Gevalt! Jews and Punk, I traced the rise of commercial punk rock in the mid-1990s because it is an important prelude to most Jewish punk bands using punk rock as a vehicle to explore their Jewish identity. If punk rock hadn’t gotten so big and reached so many people, fewer musicians would have been inspired to play punk rock afterward. When researching my 2016 book, I read My So-Called Punk (2007) and watched Punk’s Not Dead (2007) and One Nine Nine Four (2009), in addition to looking at numerous works about the individual artists involved. It was with great anticipation that I read the latest book examining the mid-1990s punk boom. Smash! 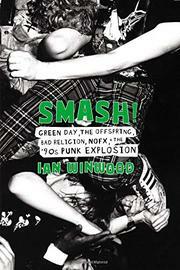 Green Day, The Offspring, Bad Religion, NOFX, + The ’90s Punk Explosion, by British music writer Ian Winwood, was published by Da Capo Press this week. Smash! is a compelling narrative of what led up to the punk breakout, the developments of 1994–1995, and, to a lesser extent, what came later. The book’s greatest strength is that it gives unparalleled access to the key artists, letting their voices shine through. Winwood was on the front lines covering the mid-’90s punk explosion, and his reporting from that time and his long-term relationships with the musicians are paramount to his understanding and framing of the material. If you’re looking to learn about how Green Day, The Offspring, and other bands got so big in 1994–1995, I recommend Smash! This is important not just for fans of those particular groups but also for anyone trying to understand how punk rock became viable as a mainstream, commercial genre of music. Winwood accomplished what he set out to do, so let’s give credit where credit is due. That being said, I had high hopes for Smash! to be the definitive account of the mid-’90s punk explosion and why it mattered. I was often left wondering how key details and effects were left out. How could the book mention Blink-182 (who had their first hit in 1997) in passing without acknowledging that their success would’ve been inconceivable if not for the book’s main subjects just a few years earlier? How could a book published in late 2018 discuss the possibility of The Offspring reuniting with Epitaph Records without mentioning The Offspring’s tour with Bad Religion and Pennywise—plus a 20th anniversary reissue of Smash, covers of two Bad Religion songs, and plentiful promotion about everyone coming together just like old times—in 2014? How could the book rightly cover Green Day’s later success with 2004’s American Idiot but not mention that American Idiot became a Broadway show (2009) or that Green Day were inducted into the Rock & Roll Hall of Fame (2015)? How did punk’s commercial breakout impact the underground punk scene? As a writer, I understand that a book cannot cover every possible tangent. As a scholar, I admit that there are some contextual elements that I would want in an academic work that might not belong everywhere. This was a trade book meant to be palatable for a general audience, not a comprehensive academic book. Still, I would have appreciated more focus on context, implications, and filling in the blanks. I don’t want these shortcomings to overshadow the praise that preceded them. And so I’d like to credit Smash! for doing something very right. I got into punk rock because of Green Day and The Offspring, and while the former have received widespread praise and respect, the latter have not. Let’s not forget that The Offspring’s Smash, released by Epitaph Records in 1994, is still the bestselling independently released album—of any genre—of all time. If any band in this book has been shortchanged of the respect owed to them, it is The Offspring. Many are the punks from this era who decry the music and achievements of a group that have been banging away for almost thirty-five years now. Despite being principal players in the cataclysmic change in punk rock’s fortunes in the middle part of the 1990s, for some the group’s rightful place lies beyond the city walls. This antipathy is about more than musical snobbery. In the fullness of time, Green Day, their neighbors to the north, escaped this fate. [Green Day front man] Billie Joe Armstrong himself once told the author that “The Offspring really don’t get the credit they deserve.” For while it took a number of years for many of California’s second wave of punk groups to receive the critical acclaim owed them, for The Offspring the wait goes on. I saw The Offspring in August, and their live show still rocked hard and was a blast. They’ve still got it.